I make these with the amazing Jenn Ski designed Mod Century Atomic Mobiles fabric for a special little something extra "Atomic" for your home...or gifting to the Mid Century Modern fan in your life! 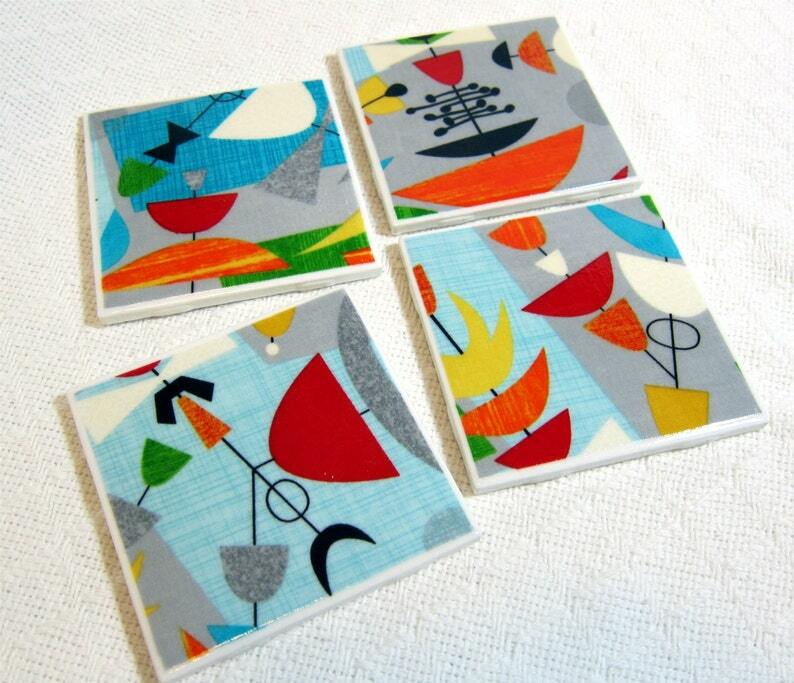 Set of 4 tiles/coasters with retro, atomic fabric on top and cork on the back to protect your mod furniture! And, as always, everything I sell comes with a 100% Satisfaction Guarantee! Atomic Starburst Drink Coasters - Great Gift Idea - Ceramic Tile & Barkcloth - Set of 4 -- approx 4" x 4"
Geometric Modern Coasters - GREAT Gift Idea - Ceramic Tile & Barkcloth - Aqua on Cream - Set of 4 -- approx 4" x 4"
Mod Atomic Retro Drink Coasters - Atoms - GREAT Gift Idea - Ceramic Tile & Fabric - Orange, Turq., Red, Yellow - Set of 4 -- approx 4" x 4"
Pink Boomerang Beat Retro Barkcloth Coasters - GREAT Gift Idea - Ceramic Tile & Barkcloth -- Set of 4 -- approx 4" x 4"
MCM Barkcloth Coasters - Atomic Age - Coral Turquoise - GREAT Gift Idea - Ceramic Tiles & Barkcloth - Set of 4 - approx 4" x 4"